I am offering The Studio Space for Your Activity AT NO CHARGE. MUSICIANS & PERFORMERS ~Invite your patrons to hear you play your own music (limited electric), promote a local theatrical performance with a short skit or…the space is especially good for a puppet show! GIVE A PRESENTATION ~ Tell us about your favorite Local Woman Artist(s) Past and Present. TEACH A LESSON FOR WOMEN ARTISTS ~ Share your knowledge. Expand their skill sets. Projector available to show Power Point Presentations and images from YOUR flashdrive. The Official 9th International SWAN Day is March 26, 2016. If you are hosting a local creative WomenArts Event please let me know Date/Time/Location and I will add it to the SWAN Days Calendar. Review the Schedule for Available Dates/Times to Host your Women In the Arts activity. 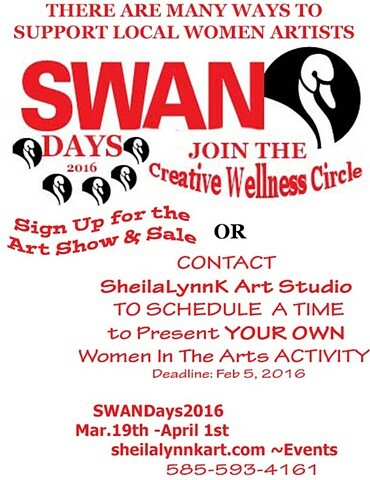 Contact the Studio by Feb 5th to add your event to the SWAN Days Schedule.